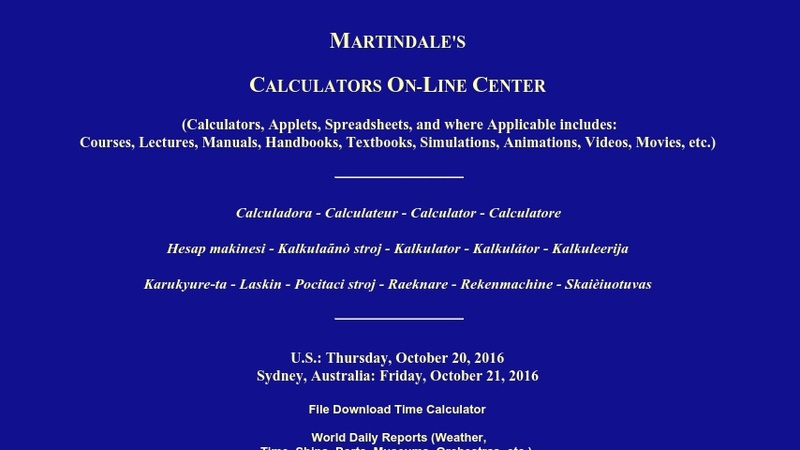 Martindale Calculators is a Web-based tool collection that contains over 19,000 online calculators created by over "3,450" very "creative" individuals, businesses and ï¿½tax supported entities world wide.ï¿½ The collection is organized by the following topics: mathematics; statistics; science A-Z; chemistry; physics, astrophysics and astronomy; engineering A-Z; and electrical engineering, computer engineering, & computer science. Each section includes a wealth of websites to explore, all related to mathematical calculations, mostly course materials and articles. Another section lists online calculators relevant for various industries, such as aviation, cosmetics, insurance, and library science. The list is organized alphabetically and creatively stretches the meaning of ï¿½calculatorï¿½ to include such things as name translators and databases on animal breeds.